2004-08-18 Assigned to ROHM AND HAAS ELECTRONIC MATERIALS, L.L.C. reassignment ROHM AND HAAS ELECTRONIC MATERIALS, L.L.C. ASSIGNMENT OF ASSIGNORS INTEREST (SEE DOCUMENT FOR DETAILS). Assignors: BRESE, NATHANIEL E., LAMOLA, ANGELO A. 2006-03-23 Assigned to ROHM AND HAAS ELECTRONICS MATERIALS, L.L.C. reassignment ROHM AND HAAS ELECTRONICS MATERIALS, L.L.C. ASSIGNMENT OF ASSIGNORS INTEREST (SEE DOCUMENT FOR DETAILS). Assignors: BRESE, NATHANIEL E., LAMOLA, ANGELO A.
Compositions suitable for use as underfill materials in an integrated circuit assembly are provided. Also provided are methods of preparing integrated circuit assemblies containing certain underfill materials as well as electronic devices containing such integrated circuit assemblies. FIG. 2 illustrates a second process of the invention, where the underfill material is not flowed under the integrated circuit. where R 1, R2, R3 and R4 are independently selected from hydrogen, alkyl, alkenyl, aryl, heteroatoms, substituted heteroatoms, and the like. 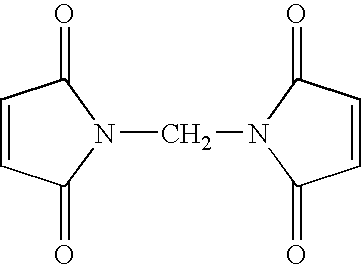 R1 and R2 or R3 and R4 may be taken together to form a cyclodiene. Typically, R1, R2, R3 and R4 are independently selected from hydrogen, (C1-C20)alkyl, (C2-C20)alkenyl, (C6-C12)aryl, or Y, and more typically (C1-C2)alkyl, C2-C12)alkenyl, (C6-C10)aryl or Y. Y is OR5, NR6R7, CN, CHO, CO2R1, C(O)R1, C(O)NR6R7, and the like. R5 is (C1-C12)alkyl, C2-C12)alkenyl or (C6-C10)aryl. R6 and R7 are independently selected from H, (C1-C12)alkyl, C2-C12)alkenyl and (C6-C10)aryl. When R1 and R are taken together to form a cyclodiene, such cyclodiene may be alicyclic or heterocyclic. Any of the above described alkyl, alkenyl and aryl groups may optionally be substituted. By “substituted” it is meant that one or more hydrogens on the alkyl, alkenyl or aryl groups are replaced by one or more substituents, such as hydroxy, cyano, (C1-C6)alkoxy, amino, (C1-C6)alkylamino, di(C1-C6)alkylamino, phenyl, (C1-C6)alkylaryl, halo, oxo (═O), imino (═NR6), keto (—C(═O)R1), epoxides, and the like. where Z is a flexible moiety such as, but not limited to, alkyl, alkenyl, aryl, arylene ether, alkylaryl, (meth)acrylic moiety, epoxy moiety, and siloxane moiety. Z may also include a mixture of any of the foregoing moieties. The flexible moiety may further include one or more diene moieties. Particularly suitable flexible moieties include poly(alkylene oxides) such as poly(ethylene oxide) and poly(propylene oxide), poly(arylene ethers), poly(arylene esters), and polysiloxanes such as those having the general formula (—O—SiR′ 2)n where n=1-100 and more typically n=10-70. Any suitable dieneophile may be used in the present invention. Such dienophiles may be linear or cyclic. Typically, the dienophiles contain one or more carbon-carbon double bonds capable of undergoing a Diels-Alder reaction. More typically, the dienophiles have one or more Diels-Alder participating double bonds where at least 2 of the 4 substituents on the olefinic carbons are hydrogen. The hydrogens may both be on the same olefinic carbon, or each olefinic carbon may have one hydrogen. Suitable dienophiles may be represented by the formula: R 8R9C═CR10R11, where R8 is (C1-C20)alkyl, (C2-C20)alkenyl, (C6-C12)aryl, or A; R9, R10 and R11 are independently selected from H or (C1-C20)alkyl, (C2-C20)alkenyl, (C6-C12)aryl, or A; where A is an electron withdrawing group such as halogen, cyano, CO2R8, CO2H, C(O)NH2, C(O)NR8 2; provided that at least two of R9, R10 and R11 are hydrogen. 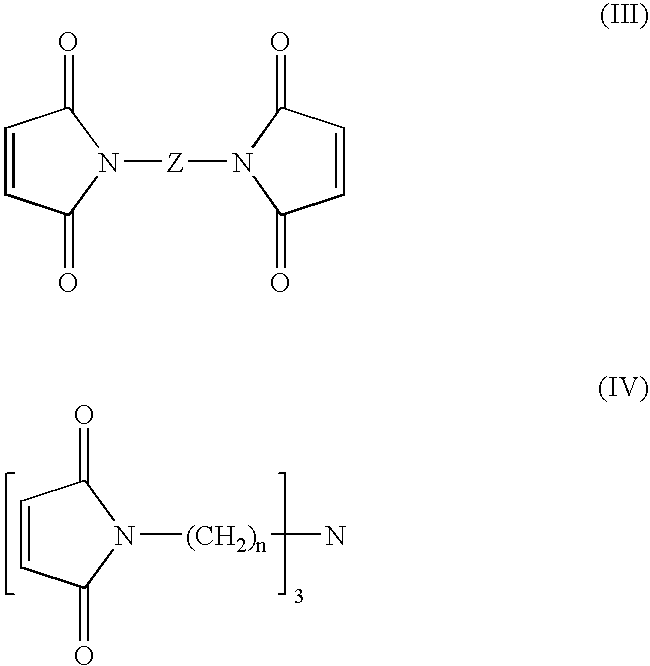 Suitable dienophiles include, without limitation: vinylpyridines such as 2-vinylpyridine or 4-vinylpyridine; lower alkyl (C 1-C8) substituted N-vinyl pyridines such as 2-methyl-5-vinyl-pyridine, 2-ethyl-5-vinylpyridine, 3-methyl-5-vinylpyridine, 2,3-dimethyl-5-vinyl-pyridine, and 2-methyl-3-ethyl-5-vinylpyridine; methyl-substituted quinolines and isoquinolines; N-vinylcaprolactam; N-vinylbutyrolactam; N-vinylpyrrolidone; vinyl imidazole; N-vinyl carbazole; N-vinyl-succinimide; (meth)acrylonitrile; o-, m-, orp-aminostyrene; maleimide; N-alkylmaleimides; N-vinyl-oxazolidone; N,N-dimethyl aminoethyl-vinyl-ether; ethyl-2-cyano acrylate; vinyl acetonitrile; N-vinylphthalimide; N-vinyl-pyrrolidones such as N-vinyl-thio-pyrrolidone, 3-methyl-1-vinyl-pyrrolidone, 4-methyl-1-vinyl-pyrrolidone, 5-methyl-1-vinyl-pyrrolidone, 3-ethyl-1-vinyl-pyrrolidone, 3-butyl-1-vinyl-pyrrolidone, 3,3-dimethyl-1-vinyl-pyrrolidone, 4,5-dimethyl-1-vinyl-pyrrolidone, 5,5-dimethyl-1-vinyl-pyrrolidone, 3,3,5-trimethyl-1-vinyl-pyrrolidone, 4-ethyl-1-vinyl-pyrrolidone, 5-methyl-5-ethyl-1-vinyl-pyrrolidone and 3,4,5-trimethyl-1-vinyl-pyrrolidone; vinyl pyrroles; vinyl anilines; vinyl piperidines; styrene; α-methylstyrene; vinyltoluene; p-methylstyrene; ethylvinylbenzene; vinylnaphthalene; vinylxylene; (meth)acrylic acid; acolein; (meth)acrylamide; (meth)acrylonitrile; maleic anhydride; epoxybutene; allylglycidyl ether; norbomene; 2,5-dihydrofuran; cyclohexane; cyclopentane; alkenes, i.e. compounds having the formula CnH2n; vinyl acetate; vinyl formamide; vinyl chloride; vinyl fluoride; vinyl bromide; vinylidene chloride; vinylidene fluoride; and vinylidene bromide. The dienophiles are well known in the art and can be purchased commercially or can be prepared by methods known in the literature. For example, bis-maleimides can be prepared according to the procedures disclosed in McElhanon et al.,  Journal of Applied Polymer Science, 85 (2002), pp 1496-1502. Such dienophiles can be purified or used without further purification. each E is independently R, H, O, OH, (C 1-C12)alkyl, (C2-C12)alkenyl, aryl and (C1-C2)alkoxy; c=0-3; d=1-100; and a′=1-20. Typically, a=2-8. More typically, R is (C2-C8)alkylene. Typically, b=1-4. In a further embodiment, d=2-80. Such polycyclosiloxanes may be prepared by a variety of methods, such as those described in International Patent Application WO 94/02536 (Buese et al.). 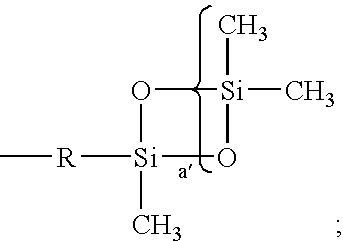 In general, re-moldable siloxane rubbers for use as underfills are prepared by reacting a mixture of an acid catalyst having a pKa of less than 0, preferably ≦−3 and more preferably ≦−5 and typically −9, one or more polycyclosiloxanes containing one or more polyfunctional siloxane unit as described above, and one or more polysiloxanes selected from linear polydimethylsiloxane, polydimethylcyclosiloxane containing from 6 to 50 silicon-oxygen bonds, linear or cyclic block copolymer of polydimethylsiloxane and a non-siloxane organic polymer, and linear or cyclic random copolymer of a siloxane of the formula Si(R 12)(R13)O wherein R12 and R13 are different and are selected from hydrogen, (C1-C18)alkyl, (C2-C18)alkenyl, (C6-C10)aryl, and hydroxy(C1-C18)alkyl. This reaction may be performed neat or in an organic solvent. Suitable polydimethylsiloxanes include, but are not limited to, those having the formula CH3(Si(CH3)2O)nCH3 wherein n is from 1 to 100,000 or higher, and typically n is from 10 to 250. 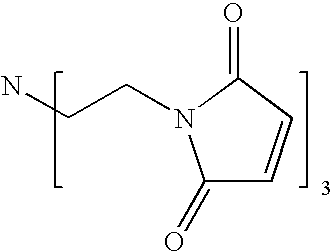 Exemplary polydimethylcyclosiloxanes include, without limitation, those having the formula (—Si(CH3)2O—)m, wherein m is from 3 to 25, and typically m is from 4 to 12. The polysiloxane component may also be composed of a linear or cyclic block copolymer of a polydimethylsiloxane and a non-siloxane organic polymer, such as, for example, polyalkylenes, polyarylenes, polyesters, polyethers, polyamides, polyimides, polyurethanes, and polyureas. 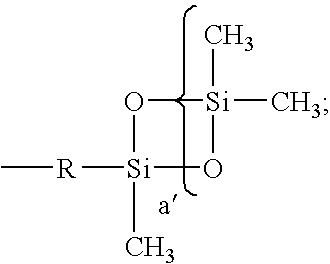 In such copolymers, the ratio of dimethylsiloxy monomer units (—Si(CH3)2O—) to non-dimethylsiloxy monomer units may range from 1:1 to 100,000:1. Generally, the present polycyclosiloxane underfill compositions are prepared just prior to use or mixed and stored at reduced temperature until use. 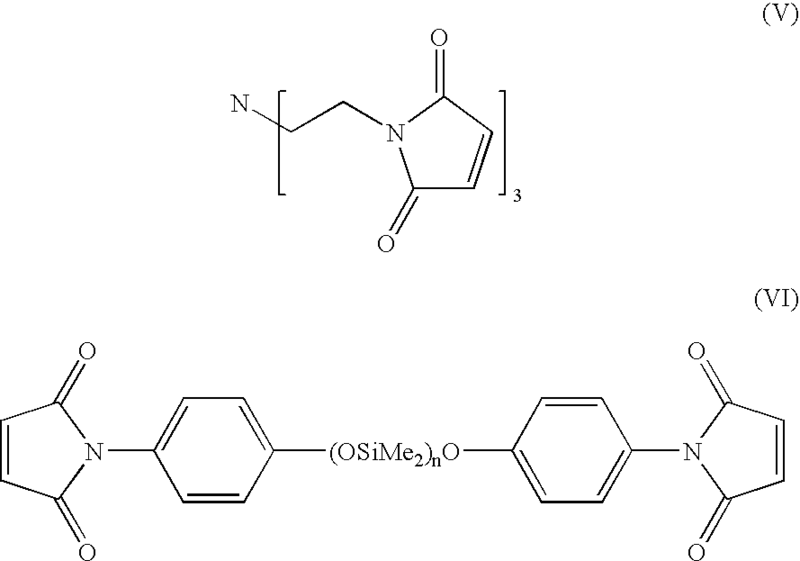 The polycyclosiloxane is first combined with any one or more polysiloxanes selected from linear polydimethylsiloxane, polydimethylcyclosiloxane containing from 6 to 50 silicon-oxygen bonds, linear or cyclic block copolymer of polydimethylsiloxane and a non-siloxane organic polymer, and linear or cyclic random copolymer of a siloxane of the formula Si(R 10)(R11)O wherein R10 and R11 are different and are selected from hydrogen, (C1-C18)alkyl, (C2-C18)alkenyl, (C6-C10)aryl, and hydroxy(C1-C18)alkyl. The polycyclosiloxane underfill composition is then combined with the acid catalyst. Next, the composition is applied to the IC assembly using any suitable method, such as those described below. The underfill compositions of the present invention may optionally contain one or more additives, such as flow aids, colorants, thixotropic agents, fillers, and the like. Fillers may be selected to provide a cured underfill with a desired CTE and thermal conductivity. Suitable fillers include, without limitation, SiO 2, Al2O3, BN, AlN, SiC, ZrW2O8, ZrV2O7, diamond and diamond-like materials. Such materials are well known in the art. Typically, a filler is used in the present underfill compositions. It is desired that a high volume of filler is used in the underfill composition as this reduces the CTE in final cured film. In general, the amount of filler in the underfill composition is any amount up to 90%. Filler is typically used in an amount of 10 to 90% by volume, more typically 20 to 80% by volume, and still more typically from 50 to 75% by volume. Suitable flow aids include surfactants. When used, surfactants are typically present in an amount of from 0.01 to 1 wt %, and more typically from 0.1 to 0.5 wt %. Such fillers are added to the underfill compositions prior to the step of applying the underfill material to an IC assembly. A schematic representation of a capillary flow underfill application is provided in FIG. 1. Referring to FIG. 1, die (or IC)  5 having solder balls (or bumps) 10 is applied to carrier substrate 15, thereby defining gap 7 between carrier substrate 15 and die 5. Carrier substrate 15 is disposed on heater 20 (e.g. at 80° to 90 C). Dispensing needle (or tube) 25 for dispensing underfill material 30 is adjacent gap 7. Underfill material 30 then flows into gap 7 by capillary flow. A schematic representation of a no-flow underfill process is provided in FIG. 2. Referring to FIG. 2, underfill material  30 is dispensed from dispensing needle 25 onto carrier substrate 15 having pads 35. A die 5 having solder balls 10 is then applied to carrier substrate 15 such that pads 35 and solder balls 10 are aligned, providing IC pre-assembly 40. The IC pre-assembly 40 is then heated to reflow the solder and cure underfill material 30 to provide finished IC assembly 45. 1. A re-moldable polymeric resin suitable for use in an integrated circuit assembly comprising as polymerized units one or more dienophiles and one or more dienes, wherein at least one diene contains at least a pair of conjugated double bonds capable of undergoing a Diels-Alder reaction and having at least one hydrogen on the first and fourth carbons of the conjugated double bonds. where R1, R2, R3 and R4 are independently selected from hydrogen, alkyl, alkenyl, aryl, heteroatoms, and substituted heteroatoms; and R1 and R2 or R3 and R4 may be taken together to form a cyclodiene. wherein Z is selected from alkyl, alkenyl, aryl, arylene ether, alkylaryl, (meth)acrylic moiety, epoxy moiety, and siloxane moiety. 4. The re-moldable polymeric resin of claim 1 wherein at least one dienophile contains one or more Diels-Alder participating double bonds where at least 2 of the 4 substituents on the olefinic carbons are hydrogen. 5. A method of preparing an encapsulated integrated circuit assembly comprising the steps of: a) providing an integrated circuit assembly comprising an integrated circuit attached to a carrier substrate by a plurality of metallic connections, the metallic connections extending from the carrier substrate to the integrated circuit to form a gap between the carrier substrate and the integrated circuit; b) filling the gap with an underfill composition comprising a binder selected from the group consisting of a Diels-Alder reaction polymer and a polycyclosiloxane, wherein the Diels-Alder reaction polymer includes as polymerized units one or more dienophiles and one or more dienes, wherein at least one diene contains one or more hydrogens bonded to each of the olefinic carbons of the diene. each E is independently R, H, O, OH, (C1-C12)alkyl, (C2-C12)alkenyl, aryl and (C1-C12)alkoxy; c=0-3; d=1-100; and a′=1-20. 8. An electronic device comprising an encapsulated integrated circuit assembly comprising an integrated circuit assembly comprising an integrated circuit attached to a carrier substrate by a plurality of metallic connections, the metallic connections extending from the carrier substrate to the integrated circuit to form a gap between the carrier substrate and the integrated circuit; and an underfill material in the gap, wherein the underfill material is composed of a binder selected from the group consisting of a Diels-Alder reaction polymer and a polycyclosiloxane, wherein the Diels-Alder reaction polymer includes as polymerized units one or more dienophiles and one or more dienes, wherein at least one diene contains one or more hydrogens bonded to each of the olefinic carbons of the diene.